Here is the configuration of three common syslog clients, that can forward logs to our syslog server. To forward logs from a linux machine to a log collector, you can either use syslogd which is the default syslog on a linux machine or syslog-ng. The configuation of the syslog-ng client is a little more difficult than the syslogd one but you can do much more with it. For example, use filters, send log over TCP or encrypt the logs sent to the server. All the logs are sent to the 10.13.44.44 log server. In this second example, we are using a filter to select which logs will be sent to the server. The filter will include notice, alert and error level messages. In the same time, they must originate from the kernel facility. For more information about a log message syntax, please check the linode website. The logs will be sent over TCP, port 54321 instead of the UDP port 514 default settings. Of course, if you want to change the port used to send the logs, the log collector must be able to listen to that port. In the example illustrated above, the syslog server can listen to both the 514 UDP and 54321 TCP ports. 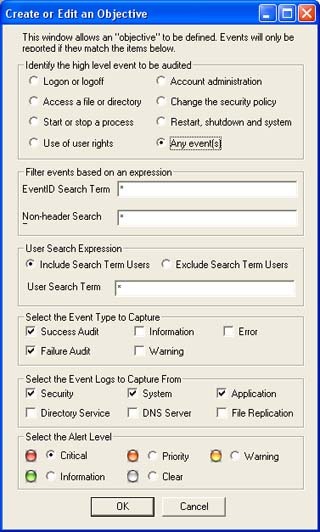 The log messages on a Micorsoft Windows can be viewed in the event viewer. To access it: right click on "My Computer" followed by "Manage". 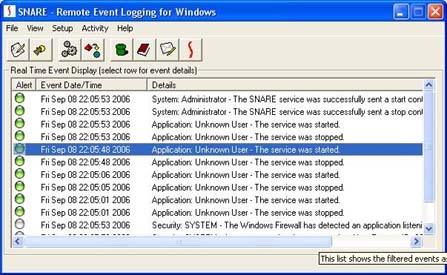 Unfortunately, Windows by itself cannot forward the logs generated by the event viewer to a syslog server. A tool called Snare is required for this function. Snare developed by the Interselect Alliance is known to be one of the best free tools for this purpose. This an open source software released under the terms of the GNU Public Licence ( GPL). The Snare agent is availabe for download on the Interselect Alliance Website. Start by setting the syslog-ng server address. Click on setup -> Audit Configuration. In our example, the syslog server is uk.syslog.qwertzy.com. Then set which type of logs will be sent to the server. By default, there are already some preconfigured rules as you can see for yourself at the bottom of the screenshot above. You can edit an existing condition or add a new one. On the Snare console, you can check the logs that will be sent to the server. 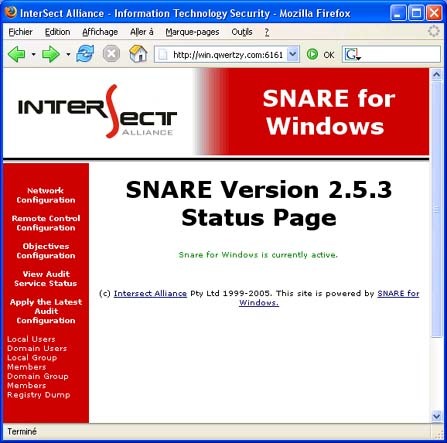 A very useful option of the Snare agent is that you can access it remotely via a web interface. Try to leave the default 6161 port. If you absolutely want or need to change it, make sure that your server does not already need to use this new port for any other application. Here is what you have to configure on your Cisco switches or routers running an IOS software. As you will see for yourself, it is very easy. Tell the Cisco device where to send the logs. 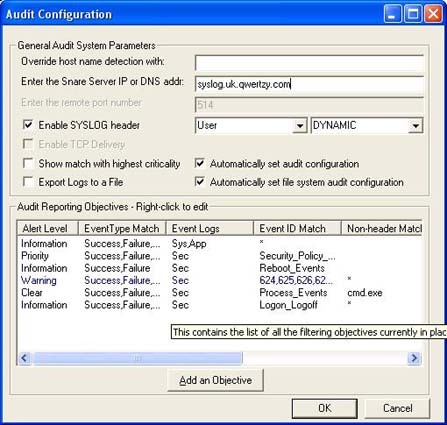 The logs can be sent to several syslog servers. Below an example where the logs are sent to two log collectors. Tells the Cisco device which kind of alerts will be sent. The default trap level is informational. If this mode is selected or if no logging trap command is set, the informational or more critical messages like emergencies will be sent to the syslog server but the debugging messages will be filtered. Be careful if you are using the logging trap debug command because a huge amount of log can be sent very quickly to the syslog server. For more informations about the different types of log levels, please have a look at the first point, "LINUX client". Below is an example where only critical alerts and emergencies messages are sent to the server. Sets the logging facility. 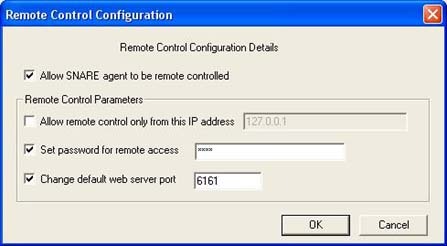 Valid facilities are local0 through local7, default being local7..
Below is an example where the Cisco device log messages are sent with a facility source of local5. You can see the logging settings using the "show logging" command. If you need more information on Cisco logging please visit the Cisco Website.